The Latinx Student Success Office (LSSO) is a joint effort of the Latina/o Studies Program (LSP) and the College of Arts & Sciences Admissions and Advising Office. The College of Arts & Sciences is Cornell's largest college, and its Admissions and Advising office serves the greatest number of Latina/o students. 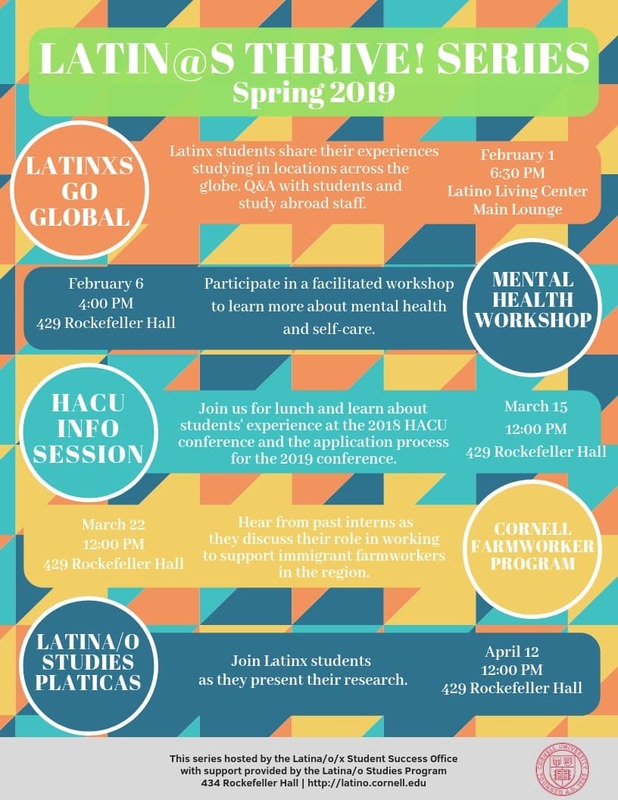 Latina/o Studies is an academic program based in Arts & Sciences but open to all students across the seven undergraduate colleges at Cornell. The welcoming environment offered by LSP makes it one of the “hotspots” on campus for Latina/o community, used extensively by undergraduate and graduate students, faculty and staff, as well as student organizations. LSSO grew out of a student and faculty vision to improve support and access to Cornell’s excellent educational resources for Latina/o students. Collaborations include the Latina/o Studies Program, Latino Living Center (residence hall), advising offices in all seven colleges, Gannett Health Services, the Center for Intercultural Dialogue, career services offices, the Office of Academic Diversity Initiatives and more. The Latin@s Thrive! series offers opportunities for students to explore their potential and thrive at Cornell by developing life and learning skills for personal and professional growth. Considering study abroad, a summer internship, or graduate school someday? Watch for Latin@s Thrive! Mi Comunidad/My Community is a mentoring program sponsored by the Latin@ Graduate Student Coalition (LGSC), Latina/o Studies Program (LSP) and Latinx Student Success Office (LSSO) at Cornell University. Read more about Mi Comunidad/My Comunity Mentorship Program.